Despite the Beast from the East, Tuesday saw a good number of members attend the meeting. 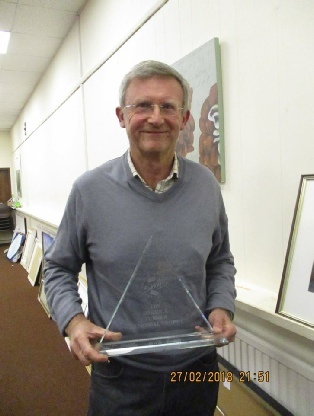 With 27 paintings entered for this category, Roger Haigh again had marathon evening ahead of him. He critiqued each piece of work, bringing his expertise into play and every member benefited from his insight. Acknowledging the hard task ahead of him, Roger selected a final four paintings, from which he chose a runner up and winner in the category ‘Change’. These joined the two from the previous meeting, from which he chose the overall winner of the Trophy. 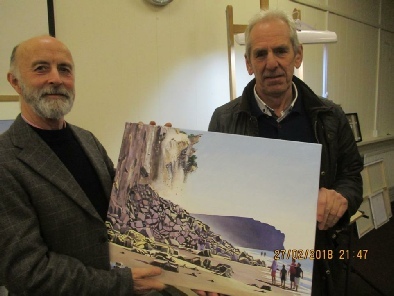 From the outstanding watercolours of Chester and Brecon Beacons, which won the ‘Over and Under’ and ‘Change’ categories respectively, and both painted by Tony Douglas Jones, Roger selected the masterly and evocative painting of the Beacons as the winner of the Derrick Turner Trophy for 2018. The worthy runners up were Kevin Strong in the category ‘Over and Under’ and Joe Rhodes in the ‘Change’ category. 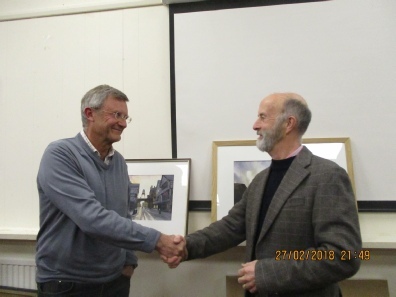 The Society extend their congratulations to Tony, Joe and Kevin and our thanks to Roger for critiquing and judging our annual competition. There is a gallery of some of the paintings in this evening’s competition, including the winners.